Preheat oven to 375°F. In a medium bowl, whisk together maple syrup and cornstarch. Add peaches and blackberries and toss gently to coat; set aside. Put butter into an 8-inch round or square glass or metal cake pan. Heat in oven just until butter is melted, 2 to 3 minutes, then remove and set aside. In a medium bowl, whisk together flour, baking powder and salt. Stir in buttermilk and mix until just combined to make a thick batter. Pour into pan over melted butter without stirring. 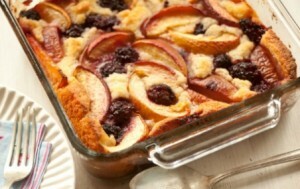 Scatter reserved peach mixture evenly over top of batter and bake until golden and bubbly, 50 to 55 minutes.